Founding Father also fathered concept of alcoholism. The “Good Creature of God,” as the Puritans referred to alcohol, was the social centerpiece in taverns throughout the colonies. The phenomenon of the village drunkard was easily understood: He was simply the person in town of the lowest moral fiber. One of the first physicians to argue that habitual drunkards were “addicted” was Dr. Benjamin Rush, a signer of the Declaration of Independence, America’s first professor of chemistry, a fervent believer in copious blood-letting, and the author of the 1812 treatise, Medical Inquiries and Observations upon the Diseases of the Mind, for which he is considered by some to be the father of American psychiatry. Rush was another controversial figure, touted by many as a heroic innovator and by others as something of a quack. Rush strenuously emphasized “depletive” remedies—anything that made the patient bleed, sweat, retch, or blister. As for alcoholism, Dr. Rush considered it a “disease of the will” resulting in loss of control over drinking behavior, and curable only through abstinence. He recommended the creation of “sober houses” where drunkards could acquire the habit of abstinence. John B. Gough, a well-known presence on the temperance lecture circuit, called alcoholism a sin, “but I consider it also a disease. It is a physical as well as moral evil.” The drunkard’s confession was a popular literary motif in the mid-19th Century. A novel written by Walt Whitman was called Franklin Evans, or The Inebriate. If Carrie Nation became the strident public face of the American Temperance Movement, Benjamin Rush was its patron saint. Nonetheless, the temperance movement remained largely committed to the notion that habitual drunks could quit if they wanted to. All they really needed was a good dose of Emersonian self-reliance. The temperance movement soon switched to an obsession with nationwide prohibition, and treating alcohol addiction gave way to activist politics and battles with the “liquor trust.” Addiction, as a concept, again transmogrified into a condition brought on exclusively by opium products. The idea of alcoholism and all other substance addictions as recognizable disease states did not significantly reemerge until the founding of Alcoholics Anonymous in the late 1930s. I love that this guy was into "blood-letting." Maybe we should try to incorporate that back into treatment. It would probably provide a pretty good incentive (see comment on disease model post to get the joke) for users as long as they aren't used to shooting up. 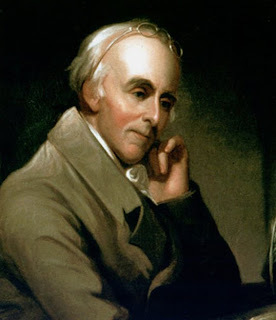 Dr. Benjamin Rush also was a devoute Christan and opposed slavery he also fought for that . He has quite an education no wonder he wrote tow books, was the treasurer of the United states mint. Signer of Declaration of Independence, First Dr of Physciaty, etc etc... What happeded to people like this? Where are the people who are driven like him? ?